How is the Pulmonica different from regular harmonicas? Why design a musical instrument for nonmusicians? What quality materials are used in making the Pulmonica? How was the Pulmonica developed? Why are you giving so many away? What type of research do you sponsor? Do you sell in quantity? What applications do you see for the Pulmonica? How does Pulmonica differ from other respiratory therapy devices? I would like to play some simple songs, how can I learn? How long should the Pulmonica really last? I bought a Pulmonica for my family member, friend, neighbor, patient, etc. Is it all right to share? Something seems to be wrong with my Pulmonica. Can I download a Brochure? How do I clean my Pulmonica? Search the Pulmonica Site for more topics. Most harmonicas have a few places that only sound good if you are a musician and know what you’re doing. These discordant sounds are unpleasant to listen to and stop most nonmusicians from benefiting from this wonderful instrument. The Pulmonica also has lower notes than most commercially available harmonicas, and it is specially tuned to set up harmonics that vibrate your lungs and sinuses. The Pulmonica is designed to obtain the benefits of deep breathing without the anxiety of trying to play an instrument. In the United States, only about 2% of people consider themselves musicians. That’s a lot of people to exclude from the benefits of playing a wind instrument. Our manufacturer, C.A. Seydel Söhne, is highly regarded internationally and has extensive global contacts. They have been making harmonicas in Klingenthal, Germany since 1847, and continue to produce innovative products with the highest quality manufacturing available. You can find more Seydel harmonicas at Seydel.com. Family members with emphysema and allergies prompted Dana Keller, PhD to learn to play the harmonica, which he knew was good for lung and sinus conditions. He quickly found that commercial harmonicas were not tuned or constructed in a manner that optimized lung benefits, regardless of price. They were made for musicians. His wife, Mary Lou, wanted to benefit from this form of lung exercise, but she didn’t want to learn to play songs on the harmonica. She just wanted to breathe long slow breaths against resistance, without musical intent. This brought a meditative and wellness aspect to the project. She also insisted that the instrument be smooth and comfortable to hold, so sharp corners wouldn’t cause injury to people with compromised immune systems. By combining his knowledge of materials, manufacturing, and music with the determination to create an instrument anyone could sound good playing while benefiting their lungs and sinuses, Dr. Keller developed the Pulmonica. And so, Harmonica Techs was formed and a medically supervised study was undertaken. The harmonica, also called a blues harp or mouth organ, is a free reed wind instrument enjoyed around the world. A harmonica is played by blowing or drawing air through one or more holes along a mouthpiece. Behind the holes are chambers containing at least one reed. A harmonica reed is a flat elongated spring typically made of brass, bronze, or stainless steel, which is secured at one end over a slot that serves as an airway. When the free end is made to vibrate by blowing or drawing, it blocks and unblocks the airway to produce sound and a resistance that varies with pitch. 80% of the world lives on $10 a day or less, and the working poor are more likely to be exposed to toxins and pollutants that can affect their lungs. We want as many people as possible to be able to benefit from this novel device. We are interested in assessing the benefits of the Pulmonica in various populations. Our first study was with older adults who had Stage 3 COPD, but they were also part of a larger pulmonary rehabilitation program. Ideally, we would provide the instruments for a study where the Pulmonica versus a traditional harmonica was the only variable. We would like to study the possible benefits to children with asthma and cystic fibrosis, as well as surgery and trauma patients. We currently sell solely on Amazon, but please contact us if you would like to buy 24 or more for a group. Our primary markets are people with impaired lung function, including those with COPD, asthma, chronic bronchitis, cystic fibrosis. There are many conditions or situations where increased oxygenation and anxiety relief could be helpful including chronic fatigue, dementia, stress and mood disorders, wound healing, diabetes, post-surgical and trauma recovery in the general public and military, and smoking or other addiction cessation. Finally, the Pulmonica can help to increase diaphragmatic control and range of movement among musicians, athletes, stutterers, obese people, and others who want to breathe better. The Pulmonica is the first fun, effective way to loosen secretions, increase the strength of the muscles surrounding the lungs, and gain the benefits of increased oxygenation and meditation. You’re not just blowing or sucking through a tube, you’re making melodious sounds that are pleasant and soothing with long, slow, deep, and complete breaths. The Pulmonica is the only respiratory therapy device you can proudly use in public, and the harmonica is the only instrument that provides exhalation and inhalation therapy. We have some sheet music and MP3s of simple, popular songs on our website, including: London Bridge, Twinkle, Twinkle Little Star, Oh Suzanna, America, and Auld Lang Syne. We have the Pulmonica alone, a guitar accompaniment, and the guitar and Pulmonica together, so you have your choice of how you would like to play. Joe Vitale, author of Zero Limits and star in The Secret, said of his experience: “When I recorded with the Pulmonica, we created a track that somehow distorts time. Every time we listen to it, we disappear. Time stops. Even though that one track is five minutes long, we listen and feel like it’s only thirty seconds long. We simply drop all thought. All stresses melt away. We are “at one” with the essence of life. It’s instant stress relief.” Find his beautiful music at http://guitarmonks.com/invoking-divinity/. In the Netherlands, we attracted the attention of Jan Mulleman, who has transcribed several popular songs so they can be played with a Pulmonica, including Amazing Grace, Wilhelmus, Pilgrim's March, Nearer My God to Thee, and Bonanza. He has also included guitar accompaniment and keeps adding new songs to his website on harmonicas, http://www.mhtmeddo.nl/de-pulmonica.html. He and his wife, Aartje - who has COPD, detail their experiences with the Pulmonica on this website. Alan Sturgess has added a YouTube video, Pulmonica - a look at its musical principles, which gives great insights into how you can use the Pulmonica to play music. Thanks to Joe, Jan, Aartje, and Alan for embracing the Pulmonica's melodic qualities. For interested musicians, the Pulmonica is tuned to LLG, uses circular tuning, and produces the complete diatonic chord scale (G, Am, Bm, C, D, Em, F#dim) for over two octaves. The four-hole chords are Gmaj7, Amin7, Bmin7, Cmaj7, D7, Emin7, Amin6/F#. The Pulmonica can serve as a wonderful rhythm instrument in the Key of G. For soloists, it's a bit more challenging because the reeds, gaps, and profiles are set to optimize pulmonary usefulness, rather than musical playability. If you would like to learn to play other songs, the Pulmonica is tuned to the key of G, and you can find backing tracks on the Internet to play along with. There are a lot of harmonica lessons online for people who want to learn to play a traditionally tuned harmonica. 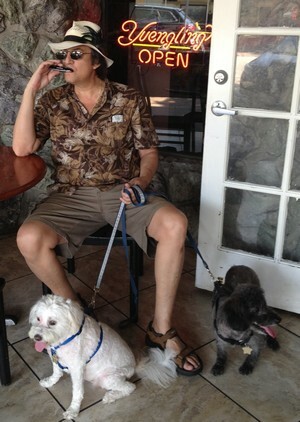 We recommend the material from JP Allen at www.Harmonica.com. Many lessons are in the key of C. You can purchase harmonicas or arrange for lessons at your local music store or online. 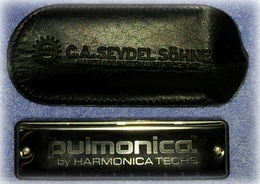 You can find Seydel harmonicas at www.Seydel.com. 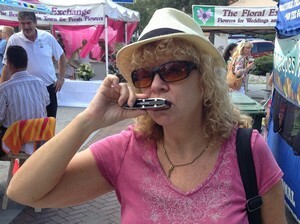 For a unique approach to playing harmonicas in medical therapy, visit Dr. John Schaman's website at www.HarmonicaMD.com. I bought a Pulmonica for my family member, friend, neighbor, patient, etc. Is it all right to share? We highly recommend that you get your own Pulmonica so you can play along with them. Even if you don’t have impaired lung function, the Pulmonica could benefit you by helping to increase your oxygenation. Some people tell us playing gives them energy, others say it helps them relax before bed. We would love to hear your story. First, try cleaning the Pulmonica by soaking it in warm water for five minutes or more, then gently moving it around in the water to try to dislodge any food particles that may have become lodged in the reeds. Do not place under running water or use a hair dryer or 'leg-slapping' to dislodge particles, as these methods can damage the reeds. Most of our returns are because people used the Pulmonica with food or sugar from soda in their mouth, and food and sugar particles accumulated inside the Pulmonica. To prevent clogged reeds, rinsing the mouth with water or brushing teeth before use is recommended. If cleaning doesn't work, please contact us directly. You can send us a comment through the Contact page on our website or call us at 888-382-9283. More than likely it’s a clogged reed and simple to repair. We can walk you through it or advise you, but we do want to hear from you.